Standing On The Outside Looking In is a splendid piece of Big Apple deep soul, full of fire and heavy hitting vocals. Parker growls and howls his way through the song to excellent effect. The accompaniment is as good as you could wish for as well - just love those horn charts especially the low low phrases from the trombone and baritone sax. 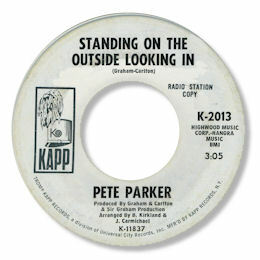 This is the sort of music that really warms the heart - such a pity Parker never cut any more tracks like this. UPDATE ~ Davie Gordon writes with the date and to say that he believes this is an LA recording. As ever I'm grateful to him for his excellent info.